The one in 6 of the population who are either deaf or hard of hearing can find it difficult to participate fully in worship. There are Church of Scotland Ministers for the Deaf who serve the deaf community across Scotland with regular services held in a variety of locations. The Church supports the work of three ministers who look after the deaf community in the areas listed below. Following the Government’s official recognition of British Sign Language, as a language in its own right, in 2003, the General Assembly urged congregations to use sign language, support initiatives for deaf people, and provide resources where appropriate. 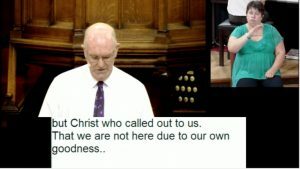 The Rev Richard Durno is the minister for the John Ross Memorial Church for Deaf People in Glasgow, and is responsible for the ministry amongst deaf people in the west of Scotland. Richard’s West of Scotland remit consists of preaching, teaching, pastoral/counselling work, development work, outreach work, quarterly deaf school children ministries. Richard has weekly Sunday morning church services in Glasgow and monthly Sunday afternoon church services in East Kilbride, Kilmarnock, and Greenock and monthly weekday afternoon services in Glasgow and Hamilton. The Rev Rosie Addis is chaplain to Albany Deaf Church in Edinburgh, as well as being the Deaf Development Worker for the Church of Scotland. Mrs Addis is based in the offices at 121 George Street and can be contacted via email raddis@churchofscotland.org.uk or mobile number 07738983393. The North of Scotland and the Western Isles. Services: 11.00a.m. First and Third Sundays of the month at the Session Room, St Mark’s Church, Rosemount Viaduct, Aberdeen AB25 1JY. Second Sunday of the month at Elgin, 3p.m. at Moray Resources Centre. Other services and venues as arranged. St John’s Church for Deaf People exists to provide services of Christian worship and pastoral care, especially suited for profoundly deaf, hard of hearing, and deafblind people who communicate with British Sign Language. The Rev Mary Whittaker, Locum at St John’s Church, also leads regular Sunday worship in Aberdeen and Elgin. She is tasked to develop further the ministry among deaf people, especially young people and children. For anyone unable to attend their own, or any, congregation, or the services organised by the team of Ministers for the deaf, alternative means of worship are available online. 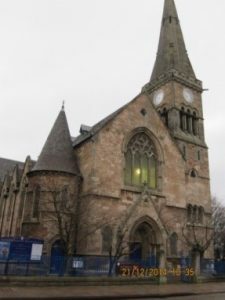 Dalziel St Andrew’s Parish Church in Motherwell offers an opportunity at the church to share in worship with both a British Sign Language (BSL) Signer and an Electronic Notetaker present each week for the Sunday morning 11.00a.m. service in the sanctuary. For those unable to attend at the church a live online ministry, incorporating both of the options of BSL and Electronic Notetaking, is available by following the live link at the church’s website home page. (dalzielstandrews.org.uk) A dedicated stream is available online for deaf and hard of hearing worshippers. This allows all, whether BSL is their first language or not, to share in worship. In addition to the live streaming of the worship service catch-up is available each week via You Tube. You Tube now offers over two years of recorded services with BSL Signer and Electronic Notetakers input. A growing number of deaf and hard of hearing people located in several countries are now benefitting from this service. Annan Weir, Session Clerk, can be contacted via the Claremont Parish Church East Kilbride website for further details. Do log in to the SCDG website for further advice notes and tips on making worship accessible to all.